We offer two lines of tanks, including a Slimline Series and a Round Series, which allow customers to choose which style fits their application best. All tanks come with features and benefits that set them apart from conventional farm tanks, allowing customers to store rainwater safely for months at a time. Many parts of the United States are in (or are about to enter) a drought period, facing possible water restrictions. In February 2009, the Governor of California ordered that mandatory water rationing and mandatory reductions in water use may be introduced. Rain tanks, or rain barrels, collect fresh rain water from the home roof and store it for times of drought. Modern rain tanks are sealed from light, animals and vegetable matter so the water stays clean for months. Proponents of global warming warn that weather patterns are already changing and traditional rainfall levels are expected to drop in many areas. Green living is now becoming a way of life for a majority of Americans. People are conscious of their 'carbon footprint' and are seeking methods to reduce the future impact on the environment and climate. 20% of California's power consumption is used to collect, transport and treat water. In areas of major urbanization the environment is suffering from increased run-off that cannot soak naturally into the ground. As a result, aquifers are not filling at a rate fast enough to restore their pre-urban levels. Water is a limited resource and the cost of its supply is certain to rise in the next few years. Most major water collection and distribution projects in California were completed over fifty years ago and no new major rainwater catchment projects are planned. Water restrictions are nothing new in California, but since the last major drought in the early 1990s, the state's population has grown by 9 million to a total of 38 million. In a press conference on March 12, 2009 the governor plainly stated that, with increased demand and limited supply, Californians can expect to pay more for water in the future. But why use good drinking water on the garden or to flush toilets? Over 40% of water supplied to most suburban households is used on the garden. This is not the best use of a product processed for human consumption. Besides, most plants enjoy the slightly acidic and soft qualities of rainwater. Bushman rainwater harvesting tanks maintain a high quality of rain water with gutter guards, insect filters and first flush devices that divert the first rains of the season to the drain. All tanks are opaque and do not allow the growth of algae. 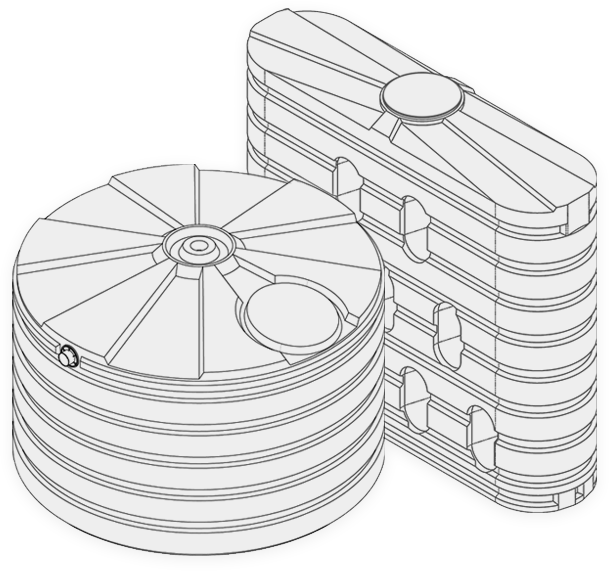 Tanks are made or lined with food grade quality polyethylene. You can easily find a water tank on the web today made for agricultural or commercial customers. These tanks are generally too large for residential use and typically come in black, white and dark green. Bushman specializes in slimline tanks that fit under the eaves of the house and come in over six color choices. Alternatively you can pick-up a rain barrel at the local nursery. While these may look great under a downpipe in your garden, they typically store no more than 60 gallons, which is inadequate for most garden sizes. We recommend a minimum of 300 gallons of storage, purpose built to collect and store clean rainwater. Also beware of recycling old plastic containers to rain barrels as they may have been used to transport harsh chemicals for their original purpose and could leech poorer quality plastic. How much rainwater can your home collect?